Will Perera fare better than his predecessors? 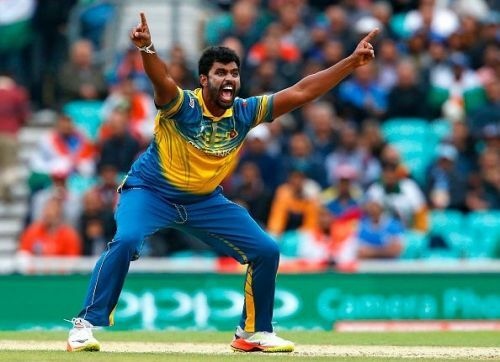 Sri Lankan all-rounder Thisara Perera will become the sixth player to captain the national team this year when he leads his side out in the third T20I against Pakistan, at Lahore. Perera was named the captain following regular limited-overs skipper Upul Tharanga's unwillingness to travel with the squad to Lahore. Perera will follow in the footsteps of Angelo Mathews, Rangana Herath, Dinesh Chandimal and Chamara Kapugedera and Tharanga, of course, who have all led the side at various points in the cricketing season. Tharanga and several other members of the Sri Lankan squad refused to travel to Lahore to feature in the third T20I of the series, citing security concerns. SLC chief selector Graeme Labrooy had clarified that only those members of the squad willing to head to Lahore to play would be considered for selection while others would be allowed to withdraw their names from the hat. This announcement resulted in nine players removing themselves from contention. Moreover, Sri Lanka head coach Nic Pothas and a member of the support staff, Nirmalan Dhanabalasingham, too have opted out of the tour. Sri Lanka have named a 16-man squad to take on Pakistan in the T20I at Lahore, led by Perera. Sri Lanka squad to take on Pakistan: Thisara Perera (capt), Dilshan Munaweera, Danushka Gunathilaka, Sadeera Samarawickrama, Ashan Priyanjan, Mahela Udawatte, Dasun Shanaka, Minod Bhanuka (wk), Sachith Pathirana, Vikum Sanjaya, Lahiru Gamage, Seekkuge Prasanna, Vishwa Fernando, Isuru Udana, Jeffrey Vandersay and Chaturanga de Silva. The two sides' current focus will be on the fifth and final ODI of the series, one that Pakistan have already clinched 4-0. Following the conclusion of the series, they will square off against each other in two T20Is at Abu Dhabi after which they will head out to Lahore to take part in the final T20I. Much like a game of musical chairs at a low-key Indian wedding, captaincy in Sri Lankan cricket has passed hands excessively frequently in recent times. The scars of the 2009 attacks may have healed as the years have passed, but playing cricket in Pakistan is still met with a raised eyebrow and hushed silence. With Tharanga preferring the comfort of his armchair to travelling to Pakistan, Perera, a T20 veteran possessing a passport furnished with stamps from most Test-playing nations, will look to bring all his experience to the fore to fill the absence of several seniors.